We’d love your help. Let us know what’s wrong with this preview of This Gray Spirit by Heather Jarman. UNSAILED SEAS The political intrigue aboard "Deep Space 9" (TM) escalates when Gul Macet's warship arrives at the station with an unexpected passenger. Cardassian Ambassador Natima Lang has returned to the station on a mission of hope, but it's one that will bring back old wounds and old ghosts. As tensions rise on all sides, Colonel Kira Nerys discovers that the line betw UNSAILED SEAS The political intrigue aboard "Deep Space 9" (TM) escalates when Gul Macet's warship arrives at the station with an unexpected passenger. Cardassian Ambassador Natima Lang has returned to the station on a mission of hope, but it's one that will bring back old wounds and old ghosts. As tensions rise on all sides, Colonel Kira Nerys discovers that the line between friend and foe is narrower than she ever imagined. To ask other readers questions about This Gray Spirit, please sign up. 4 1/2 stars. This novel started off really intriguing with the Defiant being crippled by an unknown weapon and due to this meet a new species. This species, the Yrythny, are on the brink of civil war - all the while being targeted by another species, mind you - since the two casts doesn't get along and the Defiant crew get caught up in the middle of all of this. "Who knows if these strangers have been brought here by the Other? There's no question that we face perilous times. The blockade may turn Houseborn against Wanderer after centuries of relative peace. We have neither the arms or the resources to fight them, but we are being swept by currents that decide our fate, one way or the other. The strangers may be our last chance." Keren spoke as if to Shar directly, as if she sat at his elbow and whispered the words for him alone. He was transfixed. I really enjoyed getting to know the Yrythny and the problems their society were facing. Different casts and putting restrictions on people because of which cast they belong to is something that we've had to deal with on this planet, too. That we're still dealing with. It makes you think about how we still have a long way to go. Star Trek is good at providing stories that resonates with our own life and what's going on in the world. The connection Shar feels with the Yrythny and his interest for their special genome, that he think might help his own people, is another layer to this story that I really like. I've grown to really like the Andorians and their struggles. The situation with Shar and his bondmates has made this come alive for me in a whole new way. Light years apart from him his bondmates are trying to get Thriss under control. Shar leaving for the mission in the Gamma Quadrant has been hard on her, to say the least. It's easy to feel for her and get emotionally attached to her situation. She's one of those characters that grab a hold on you. With the Cardassians coming to the station for negotiations and trying to improve their relationship with the Bajorans there's a lot going on and emotions are running high. I like that you can think you know pretty well what's going on, and then have the tables turning on you. It's not always easy to tell whose on your side and whose not, which makes for an interesting read. This Gray Spirit, Heather Jarman's first foray into the world of Star Trek fiction, continues the Mission Gamma DS9 relaunch series which started with Twilight. Jarman's effort is valiant, advancing several key plotlines with surprising grace, yet simultaneously taking the reader through a series of sharp twists and turns that make the ride all the more exciting. Devastated by damage from an alien minefield, the Defiant encounters friendly assistance from the Yrythny, a Gamma Quadrant species at This Gray Spirit, Heather Jarman's first foray into the world of Star Trek fiction, continues the Mission Gamma DS9 relaunch series which started with Twilight. Jarman's effort is valiant, advancing several key plotlines with surprising grace, yet simultaneously taking the reader through a series of sharp twists and turns that make the ride all the more exciting. Devastated by damage from an alien minefield, the Defiant encounters friendly assistance from the Yrythny, a Gamma Quadrant species at war with the Magisterial Cheka Kingdom. Ezri and Shar find themselves dragged in to a burgeoning civil war between clashing social castes, while Vaughn and the remaining crew must come up with a way to defend the Defiant against future damage. Meanwhile, Kira and Ro prepare for peace talks with the Cardassians as Bajor enters a new phase in its social development. The Defiant's Gamma Quadrant mission has a fascinating premise: social engineering, caste warfare and a genetic timebomb all rolled into one. Despite a very choppy start (Jarman's writing is far too deadpan and unvarnished in the first few chapters for my liking), I enjoyed the worldbuilding that took place here for the Yrythny culture. Commander Vaughn largely takes a backseat here (sometimes to the detriment of his character), allowing Ezri and Shar to shine in their handling of the burgeoning Yrythny civil war. Ezri's arc of dependency on her past hosts is nicely written, and one gets the feeling that she's finally on a solid path to self acceptance and career certainty. Likewise, I enjoyed seeing the lengths that Shar went to in order to pursue his scientific research to foment peace between the Houseborn and the Wanderer Yrythny castes. The author makes a valiant attempt to give life to believable individuals within the Yrythny civilization, however I felt that a number of them became rather bland and unsympathetic as time went by (perhaps with the exception of Keren). The Cheka (This Gray Spirit's bad guys) are largely written as a plot device to involve the Defiant in the Yrythny's affairs. Their presence here is perhaps unnecessary - the Yrythny story is already enough of a hook to sustain the writing. I'm breaking down the station storyline into two parts: Andorian and Bajoran. Let's start with the Bajoran. The revelation that Gul Macet is transporting dignitaries from Cardassia in the form of none other than Natima Lang (Season 2's "Profit and Loss") clearly has huge ramifications. Any prospect of diplomatic relations between Bajor and Cardassia is clearly something with the potential to stir up dissent on Bajor, and the resulting story doesn't disappoint. Kira's journey here is en par with her personal milestones in episodes such as "Duet", "Sacrifice of Angels" and "The Changing Face of Evil". Jarman writes Kira very well, and takes her on a believable journey to position her as a surprising advocate for the Cardassians. I loved the inclusion of Tora Ziyal's artwork as a framing device for the talks - this lays Kira's emotions bare and pushes her to a level of vulnerability that's (at times) emotionally fraught to read. Without spoiling the outcome, I confess to falling prey to the misdirection on thumbing the person responsible for derailing talks. This whole storyline is progressing in some fascinating directions which will have very real repercussions for Alpha Quadrant politics going forward. Bravo! On to the Andorians. Oh dear. Try as I might, I just could not get into this storyline. I continue to have zero interest in Shar's bondmates (even his enigmatic mother lost me at this point). Far, far too much time is given over to this soapy storyline, with interminable passages about Thriss' (frankly annoying) childlike qualities and temper tantrums and the staid responses of Anichent and Dizhai. The storyline moved at a snail's pace, failing to ignite any excitement or sympathy in me as a reader. If not for my determination to make it through to the more interesting Bajoran politicking, I'd have given up long ago. Jarman tries to round out the plot with the introduction of Counselor Phillipa Matthias and her family, but her involvement with Thriss taints her as a character and quickly eradicates any desire I may have to find out more about her. I very nearly knocked the whole book down to two stars based on this Andorian storyline, but the meaty Bajoran politics (especially toward the end) saved it that dishonor. The ultimate coda to the Andorian storyline lacked any emotional resonance for me, purely because of a complete disinterest with the characters. It's a shame, because the relaunch has shown us it can craft compelling and believable characters from scratch. Just not in this case, it seems. The epilogue sows the seeds for more delicious Bajoran drama in Book 3. Let's just hope it's more Andorian lite than this volume. Another interesting DS9 relaunch novel! This book reminded me why Deep Space Nine was my favorite Star Trek series. The intellectual level of the characters is so thought provoking. I read book one of Mission Gamma, and I thought it was really slow. I was hoping book 2 would be better, and fortunately, it did not disappoint. "Mission Gamma" has been a great series so far. Deep Space 9 has always been my favorite Star Trek, and Kira Nerys has always been my favorite character. One of the things that's so great about the post-series novels (dubbed the "DS9 Re-launch") is that you get to see Colonel Kira in full swing as commanding officer of the station after the disappearance and assumed death of Captain Sisko. Although I know enough about the later novels in the series to know that they eventually bring Sisko back, "Mission Gamma" has been a great series so far. Deep Space 9 has always been my favorite Star Trek, and Kira Nerys has always been my favorite character. One of the things that's so great about the post-series novels (dubbed the "DS9 Re-launch") is that you get to see Colonel Kira in full swing as commanding officer of the station after the disappearance and assumed death of Captain Sisko. Although I know enough about the later novels in the series to know that they eventually bring Sisko back, I'm in no hurry. At this point I actually think it's a mistake to do so. At the end of the series the station lost a good 3/4 of its title characters (a few deaths, a few re-assignments to other posts, etc.). Introducing new characters to a well-established cast is tricky. But beginning with "Avatar" the re-launch has very carefully established them, and it has been successful. The "Mission Gamma" series focuses heavily on characters that never even appeared in the series, and I'm as invested in Vaughn, Tenmei and ch'Thane (and all of the Andorian characters) as I ever was in the departed Odo, Garak and O'Brien. It makes the addition of Ro Laren from Next Generation as the station's security Chief icing on the cake. I should disclaim that this was the first Relaunch book I tried to read...and frankly, the Relaunch ultimately did very little for me. Your mileage will definitely vary on this. I picked up the book for the Cardassia/Bajor plotline, and that was the half of the book that I finished. I generally enjoyed that, and felt Jarman did a good job of depicting the "one step forward, two steps back" aspect of Cardassia and Bajor trying to put such a long and painful past behind them. Gul Macet and (view sp I should disclaim that this was the first Relaunch book I tried to read...and frankly, the Relaunch ultimately did very little for me. Your mileage will definitely vary on this. I picked up the book for the Cardassia/Bajor plotline, and that was the half of the book that I finished. I generally enjoyed that, and felt Jarman did a good job of depicting the "one step forward, two steps back" aspect of Cardassia and Bajor trying to put such a long and painful past behind them. Gul Macet and (view spoiler)[Ziyal (hide spoiler)] were very well-used in that regard. An excellent entry in the DS9 relaunch! All of the characters get ample "screen time" (or would that be "page time"?) and the stories are just as emotionally relevant and character-driven as the Deep Space Nine television series often was. In particular, the author's handling of Kira and Ezri are excellent. The invocation of Ziyal's memory and the use of characters from DS9's past are particularly welcome. Heather Jarman is clearly someone who knows her Trek! Full review: http://treklit.blogspot. An excellent entry in the DS9 relaunch! All of the characters get ample "screen time" (or would that be "page time"?) and the stories are just as emotionally relevant and character-driven as the Deep Space Nine television series often was. 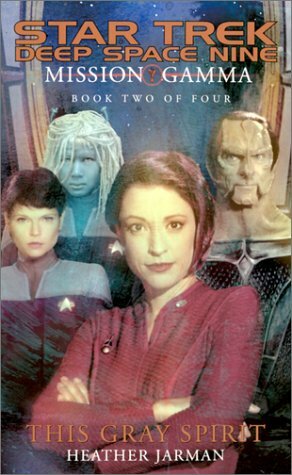 In particular, the author's handling of Kira and Ezri are excellent. The invocation of Ziyal's memory and the use of characters from DS9's past are particularly welcome. Heather Jarman is clearly someone who knows her Trek! TGS is the first of these relaunch novels I've read where I've thought they really needed a copy editor ("phased" does not mean "fazed," guys), and in general there were some jarring turns of phrase. I kept thinking: "that's not really what you mean." But it was entertaining enough - I really liked the Space Problem they had to deal with, and the politicking took some interesting turns this go around. The season continues with more problems on DS9 caused by talks with the Cardassians. Meanwhile, the Defiant meet a species that is separated by castes and prejudice. This is a very involving storyline and a substantial read. The character development is great, and this does feel like a real continuation of the tv series. A very good read. I like this book a little better than the first. The thread about Shar and the rest of the Andorians and the plight on Vanimel were interesting. In particular, the last 100 pages or so was absorbing. There is a lot going on throughout the book, but I wasn't as interested in the rest of the plot lines. Also, I felt Ezri did not quite ring true. Ok so this to me was the first stumble in the “season 8” relaunch of DS9. The stuff going on the station is interesting and really kept my interest but the stuff in the Gamma Quadrant is a snore. Feels like so much is going on without much detail and I just didn’t care. The entire DS9 relaunch (via novels) was fabulously done - especially the Mission Gamma series of four books. It was as if the beloved series had never ended . . . a real treat for anyone who loved the series and lamented its end. If you loved DS9, read the DS9 relaunch! I loved the Mission Gamma series, and this is another great installment. Combines the spirit of the original Trek with the wonderful cast of characters in DS9. Another book that proves DS9 had legs left after the series ended. Continues the very Trek style of story telling I've come to expect.